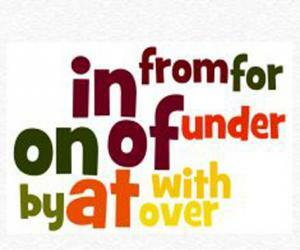 This is a fun song to help you learn some basic prepositions: in, on and under. 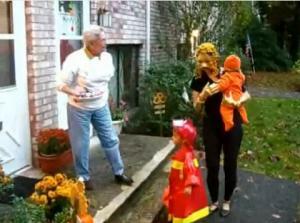 Watch the video, sing along and see how many you can get right on your own. Move the animals into the position requested. 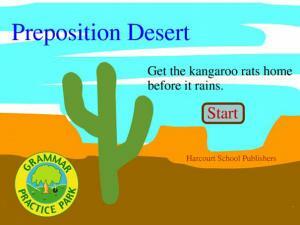 A fun, elementary game to introduce you to prepositions of place. 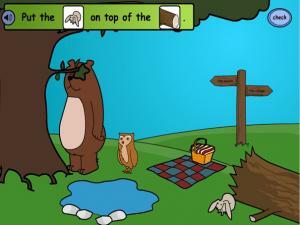 Listen to the audio and find the animal you have to move at the picnic. Drag into the right place and check your answer. The audio is very clear and you can listen to each preposition and the whole sentence whenever you want. 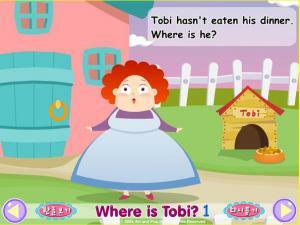 Tobi hasn't eaten his dinner. Can you help find him? Learn which prepositions you use for different places and locations as you go round the house with this fun animated lesson. Move the animals into the position requested. 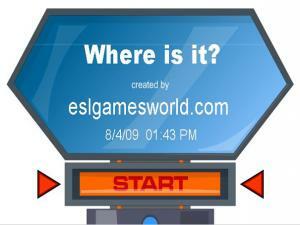 A fun, elementary game to introduce you to prepositions of place. 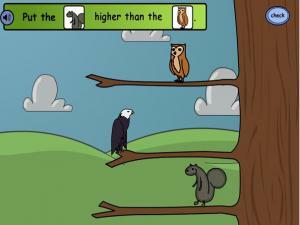 Listen to the audio and find the animal you have to move in the tree. Drag into the right place and check your answer. The audio is very clear and you can listen to each preposition and the whole sentence whenever you want. 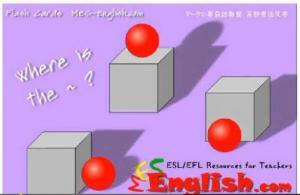 A fun, elementary game to introduce you to prepositions of place. Read the sentence and see which animal you have to find in the tree. 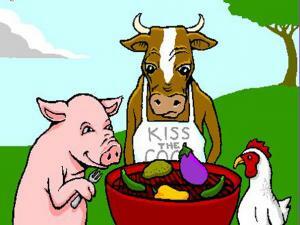 Then choose the right word for the position of the animal. The audio is very clear and you can listen to each preposition and the whole sentence whenever you want. 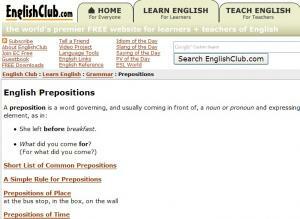 Do you remember the English prepositions? 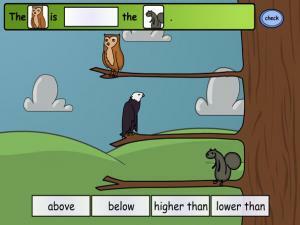 This audio memory games asks you to match the picture with the sound of the correct preposition. If you make a mistake, you'll know which words to study. Prepositions describe time, location, transportation and communications. They are small words like: at, on, in. Prepositions are sometimes difficult for students. This is an excellent study lesson for beginners. Continue with the exercise to check your understanding. 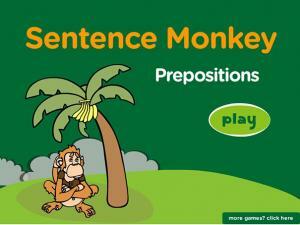 Timed grammar game about prepositions of location. Listen and select the picture. 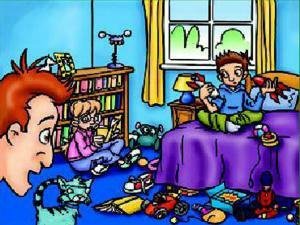 This is a simple audio book about tidying your bedroom using prepositions of place. Look at the pictures and writing as you listen to the audio and try and learn the different prepositions for each location. A quick visual exercise for you to practice prepositions of place. 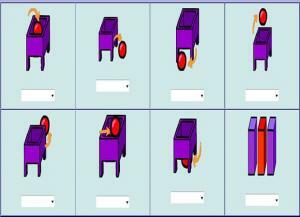 Look at the picture and allocate the correct preposition to each one from the drop-down box. This video talks about how to use IN, AT, and ON for time in English. 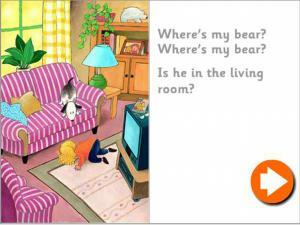 An audio book for beginner and elementary students using 'in', a location preposition. Listen and follow the words in the book. Can you find the bear? Learn vocabulary related to prepositions of movement (under, over, through, etc.) in this set of video flashcards. Listen to the English pronunciation as you hear each term. Learn vocabulary related to prepositions of movement (into, beside, etc.) 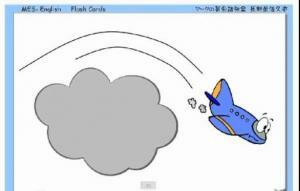 in this set of video flashcards. Listen to the English pronunciation as you hear each term. 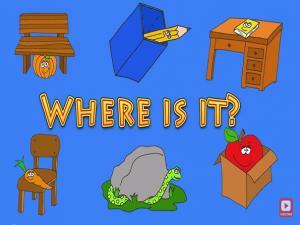 A preposition of place is a preposition which is used to refer to a place where something or someone is located. 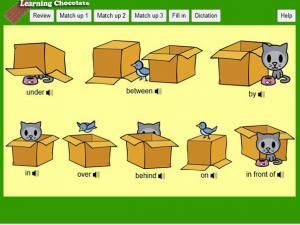 Check out this fun game and learn how to describe the location of the kitten and bird. "over", "on", "in", "in front of"; review the vocabulary for these basic prepositions of place and test your knowledge with the 5 games. 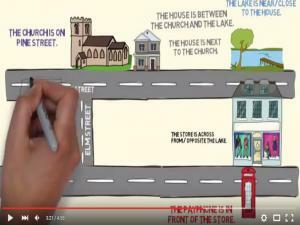 A fun, animated video lesson to help you understand and learn prepositions of place and how to use them when giving directions. Watch the streets and buildings as they come to life and learn where everything is in relation to other buildings. 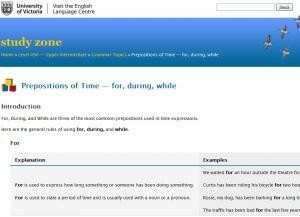 These three prepositions are often used in prepositional phrases about time. 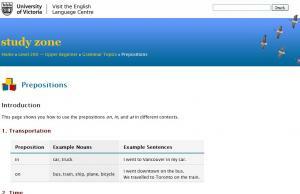 This page contains an explanation on which to use in different contexts with examples. 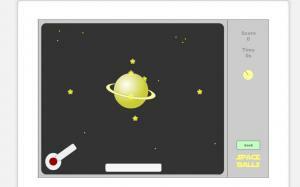 The self-quiz will tell you when you get the answer right or wrong with a brief explanation. Are you confused about when to use "to" and when to use "for"? Then this lesson is for you. Watch the free video class, then answer the questions in the lesson quiz and check your understanding of the lesson. Can you make the teacher walk the plank? 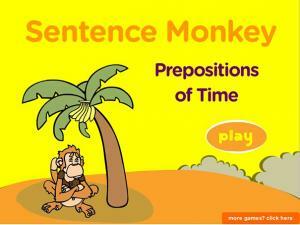 This is a game to help practice prepositions of time (at, in, for, during). Answer the question correctly by choosing the right preposition. Practice some prepositions of time (at, on, in, for, since etc) by reading the sentences and choosing the right word to complete the phrase. 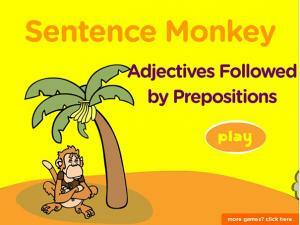 Submit your answer and see if the monkey thinks you are right! 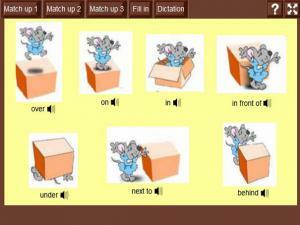 Practice some prepositions of place ( in, on, behind, in front of etc) with this fun interactive game. Use it to review your vocabulary and grammar or simply practice the words. 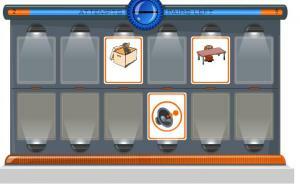 This is a great 'true or false' game to help you practice place prepositions. Look at the 9 pictures and answer the questions about the animals. After each question click OK to see your score. At the end you can get a full quiz sheet to see how well you did in the whole game. This is a listening game with prepositions of place. Listen to each description and try and decide which picture each audio section is referring to. You can also read the transcript of the audio at the end. Each preposition is repeated. 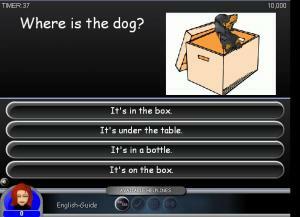 Prepositions are words that show how a noun or pronoun relates to other part of the sentence.Select the preposition in each sentence in this quick quiz. Check your answers at the end. 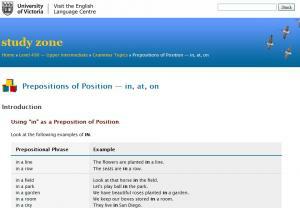 Prepositions are small words such as: at, on, under, about, with, in, etc. These words are difficult to learn because they rarely translate to other languages consistently. This lesson gives you lots of practice with more than 15 exercises. 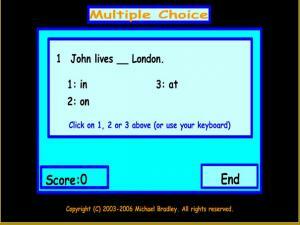 This is a free online interactive multiple choice quizz to help you practice the correct use of in / on / at. Answer the ten questions and see how well you do! 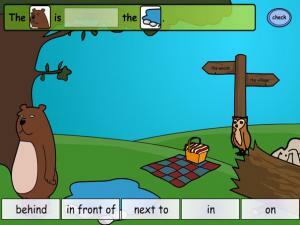 This is a memory audio game to help practice prepositions of place. You have to match up the pictures with their correct audio description to create matching pairs. 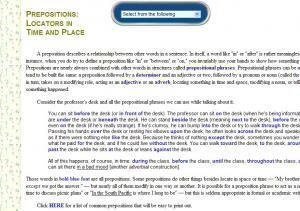 Learn the history of prepositions and hints for choosing the correct one in this podcast. 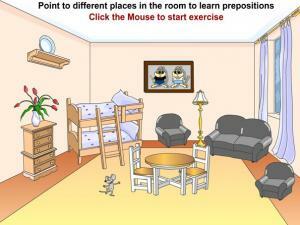 This is part 2 of a lesson on prepositions of location and direction. In this part, the details of prepositions of location are further discussed. 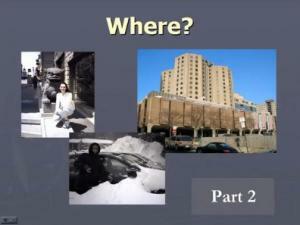 This is part 3 of a lesson on prepositions of location and direction. 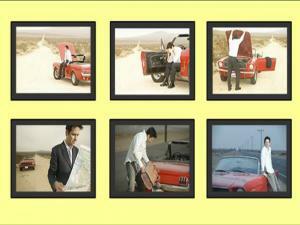 In this part, the details of prepositions of direction are further discussed. 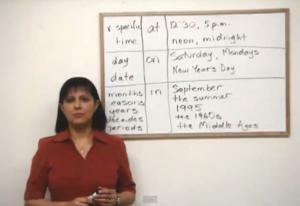 This video talks about prepositions of location and direction. There are some exercises for you to practice at the second half of the video. 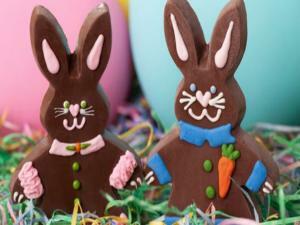 Tell us about your favourite day of the week. What time do you get up? What do you do, and when? What is the best part of the day for you? 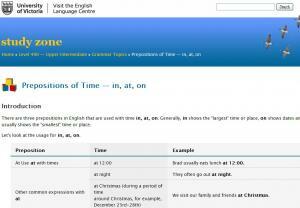 We use many different prepositions for talking about time. Watch the video and follow the conversation notes. A fun video to help learn the different uses of prepositions and also how easy it is to choose the wrong preposition, depending on the context and meaning of a sentence. It has fun graphics and an interesting lesson layout that will keep your interest throughout the video. 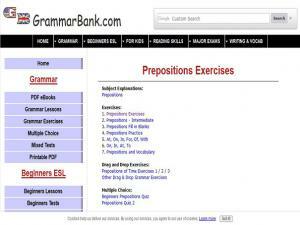 Excellent resource for learning and practicing the use of all types of prepositions. 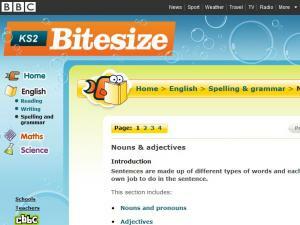 Includes formal/informal uses (prepositions at the end of sentences) as well as detailed explanations and quizzes. 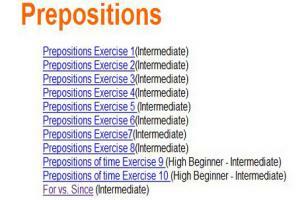 A list of various exercises for Intermediate and High Beginner students on prepositions. 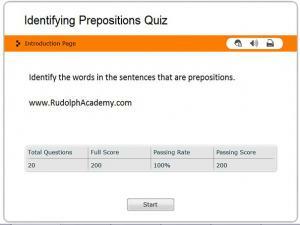 Some exercises are multiple choice and some ask you to write in the correct preposition to complete a sentence. Practice using the common prepositions like (of, for, at, in, to) after an adjective with this interactive sentence game. Look at the options, read the sentence and pick the preposition that you think completes the phrase. How well do you know your prepositions? Read the sentences and decide whether the underlined word is a true preposition or the object of a preposition and get the kangaroo rats home before the rain! 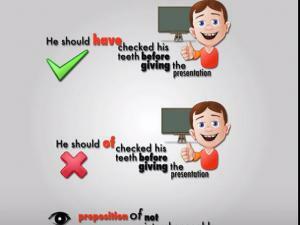 Choose the correct preposition for each sentence. 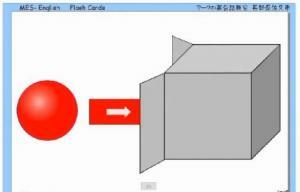 Use the tab key to move from box to box or use your mouse-button to click on your answer. Get a full review of all your answers to see how many you got right at the end! 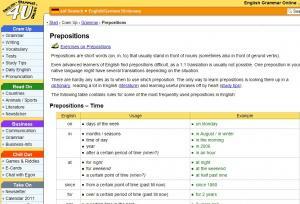 This site offers detailed explanations about academic, proper English prepositions usage; it does not reflect how English is spoken in daily life. "But" is not just a conjunction! 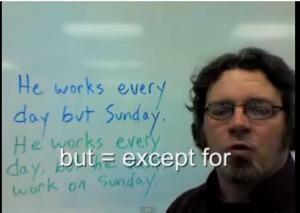 This simple grammar video lesson explains how to use "but" as a preposition. 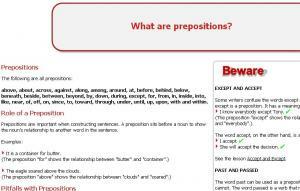 A great resources with lots of different exercises and quizzes to test your understanding of prepositions. Work your way through all of them, or just pick the type of preposition you want to practice. There is something for everyone!